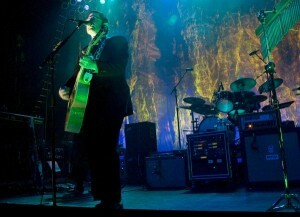 The Decemberists may have their Hazards of Love shows down to a slick science now, with guitar techs scurrying about the stage, guitar straps outstretched so that the musicians can simply walk right into their next instrument, but that doesn’t make the show any less poignant or enjoyable. Hazards, and the whole idea of performing the album in its entirety on tour, seems to be somewhat divisive amongst Decemberists fans; I think it’s either one of those things that you love, or that you hate. As a fan of (well-executed) concept albums, I’ve been fascinated by Hazards since it was released, so I’m firmly in the “love” camp. While I caught some of their Hazards set at Lollapalooza, there’s something wholly different about seeing it performed onstage at a music hall. At the huge “throw and go” festivals, the band is constrained by a strict set time limit, by weather and timing and pre-set stages and light shows. With Hazards clocking in at just barely under an hour, there’s no room for error in performing it for a festival, leading to a set that, while very tight, can seem almost tense at times. At the Riviera on Thursday night, though, things seemed to flow a bit more naturally. The stage setup was gorgeous, and perfectly suited to the mysterious nature of the album. A simple white screen hung at the back of the stage, with long gauze-y fabric hanging down. The light setup was fantastic — colored lights illuminated the screen and fabric with just the right colors at just the right times — green while singing about the forest, a gentle blue-green during “Annan Waters” and the final song. A bright white light illuminated Becky Stark as Margaret at times, and with her flowing white dress she simply looked angelic. Everything about the set and light show was obviously well thought out; it’s nice to see these things done with meaning instead of just “hey, look, cool flashing here”. the Prelude. I’m not even joking, I kind of got a little choked up as the Prelude progressed and the rest of the band took the stage. Seriously, I don’t even know. Shara Worden, as always. She is simply so commanding of a presence on stage while performing as the Queen. Her voice is just unreal to me. The audience. While I was up in the balcony, which is always more sedate, the people on the floor were just going nuts the whole time. The energy down there must have been ridiculous. After a standing ovation and a short break, the band returned for another set of their older material, which was just as enjoyable. I can’t say it’s lighter in content than Hazards, as the subject matter of the average Decemberists song isn’t exactly cheery. But it was definitely more upbeat in tone if not in words. Strange and awkward though he may be, Meloy’s the perfect frontman for an indie darling band, and the crowd loved him. Charming enough to keep the crowd engaged no matter what he was doing, he even managed to get cheers whenever he snapped a guitar string during The Crane Wife #1 and scurried away from the guitar tech who came out to replace the guitar. He was bound and determined to finish, and no guitar tech was going to get in his way. The band ended their set with a cover of Heart’s Crazy on You, with some fantastic vocals by Becky Stark and Shara Worden. The encore was “Save Yourself”, a gorgeous song with just Colin and his guitar. The final song, “Sons & Daughters”, was a wonderful closer, complete with audience participation on the refrain of “hear all the bombs fade away”. “You’ll carry it home with you,” he said of the refrain, “it’ll follow you home and climb into bed with you and spoon up with you, and in the morning, it will be there, making you eggs. This refrain will make you an omelette.” I might not have had an omelette waiting for me this morning, but I did have the poignant refrain of this song running through my head all day. The night wasn’t without its problems, minor as they may be. It seemed like there were some difficulties getting the organ part to line up with the recorded children’s voices on Revenge. But my biggest gripe has to be with the sound. From my seat in the balcony, the sound was terrible at times. At first, Colin Meloy’s vocals were up so high that they practically drowned out the band. Meanwhile, vocals for Becky Stark and Shara Worden got lost amongst all of the other noises they had to compete with. Worden fared a bit better, given that her part calls for a lot of “big” singing, so Stark’s vocals in particular were far too often buried underneath the many other instruments on stage. Her voice and character in Hazards are both delicate, and more attention should have been paid to the sound mix to ensure that her voice actually came across. Not my video, but major props to this person for getting some great shots from the front.